Treats and praise help your pup learn to fetch slippers. Having your dog fetch your slippers is a classic party trick and a good way to stimulate your dog mentally. This trick combines the "fetch" command with the specific object of your slippers. Work each concept separately in short training sessions, then integrate the two commands together. Teach your dog the basic of "fetch" first. To do this, hide a treat inside a toy or even a tennis ball with a slit down the middle. Toss the toy and say the word "fetch," then wait for your dog to go for the toy. When your dog gets the toy, verbally praise her. Reward your dog with a treat when she brings the toy back to you. This reinforces the concept of "fetch" and clues your dog in to the fact that she'll get a treat if she returns the toy to you. Practice "fetch" with the toy until your dog gets good at this game. When she understands the game of fetch, you can introduce the slippers. Place your slippers a short distance from you and hide a treat inside one of the feet. Say the word "slippers" and point. Work on this for a few days until your dog understands that the word "slippers" refers to those shoes and that there's a treat in it for her. 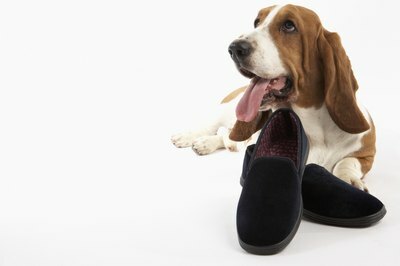 Put the two tactics together: Place your slippers a short distance from you then tell your pet to fetch your slippers. She should run to the slippers, pick them up, and bring them to you. If your pup understands "fetch" and "slippers" but doesn't fetch the slippers for you, walk her through each part of the action -- such as picking up the slippers in her mouth, then bringing them to you -- and slip her a treat after each. Keep working it until she gets it.